Zinnia is a genus named by famous botanist Carolus Linnaeus in honour of German botanist Johann Gottfried Zinn. 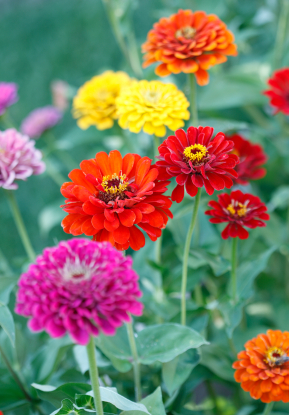 The zinnia is a long-lasting flower that can cope with periods of dry, hot weather. The flower comes in a variety of bright colours like orange and red and will attract bees and butterflies to your garden. They can grow quickly, reaching 60 cm in height and spreading up to 75 cm and will adapt to most garden settings. The zinnia can be found in the south west of North America, particularly Mexico and throughout South America. Because of the hot, dry landscapes found in this region, the flower is able to flourish when placed in full sun. Zinnias will flower between May and October and can be grown from seeds. They can be propagated indoors and planted outside once the cold, frosty weather has passed. Zinnia is the name of the genus and there are 20 species within in, although only 10 are suitable for the garden. The most common species found in gardens is the zinnia elegan. Zinnias do not require too much care. However, regular dead-heading will help produce blooms while increasing its natural lifespan. As long as the flower is placed in an area receiving a minimum of six hours of sun per day, it should adapt well to all types of soil conditions. Keep an eye out for fungus, bacteria and mildew, as well as insects such as caterpillars and spider mites. Although zinnias can survive a light frost, avoiding cold weather altogether is advised as the flower may wilt and perish. Inserting a small length of wire through the top of the flowers and down the stem will correct kinks or deformed stems. Zinnias are believed to have been introduced to Europe in 1613 from their native habitat.